I hate writing learning objectives. I see the value. I do. At least from the instructional designer's and the business's point of view. Learning objectives clarify exactly what it is you're trying to teach. But I find them painfully boring to read and to write. Ray Sims has written a great summary on Writing Learning Objectives, with citations to some good resources, including Vicki Heath's post Learning Objectives: Writing Learning Outcomes So They Matter. Vicki states as the first benefit of learning objectives: "Learners can focus more easily on what is important to their actual workplace performance." Her statement is in keeping with traditional instructional design theory that says that learning objectives help learners organize their learning efforts. And yet one could argue that most learners don't even bother reading them. The objectives page is one that I always click NEXT to slide right on by. How about you? If you have ever taken an eLearning course (and be honest -- have you really taken an eLearning course? ), have you taken the time to read those objectives? Really? One approach, as Cathy Moore demonstrates so well, is to write better objectives. See her recent post: Makeover: Turn Objectives into Motivators. 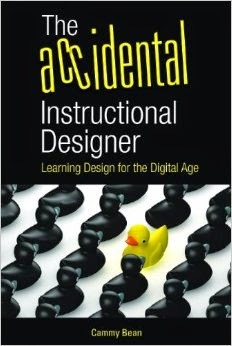 Allen urges instructional designers to break the rules: "Don't list objectives." Pretty radical, isn't it? I called this one out as one of the top things I learned about learning in 2007. Instead, provide some meaningful and memorable experiences using interactivity, graphics, animation, and storytelling. Put the Learner to Work (p. 161) Have the learner attempt a task. If they fail, they'll know what they are going to be able to do when they finish your program (hopefully, complete the task). Instead of a traditional, boring assessment, create a game-like quiz. Based on their performance, learners will see if they are beginners or advanced, and where their gaps in knowledge might lie. And they'll be able to see what kinds of tasks they should be able to do at the end of the course. Check out Karl Kapp's Gadgets, Games and Gizmos for Learning for some simple game ideas. Have you experimented with alternatives to listing out learning objectives? Do you have any good stories? Have you had a client push back when you've tried to eliminate the learning objectives page? Great post Cammy. As a learner, I absolutely hate learning objectives, particularly when they're the first thing you see. What they achieve, right up front, is to make clear that this is not going to be a fun experience. They're like credits in a film - there to satisfy some arcane long-forgotten procedural requirement. Which is why you often get an introductory scene before the opening credits - a technique I've used in e-learning when the client absolutely insists that the objectives be present. Trainers, get a life. That's a great tip, Clive. You satisfy the learner with a cool opening scene and you satisfy the client by listing the objectives (which the learner can now skip). Cammy, I hate learning objectives, too--with a passion. I see them as more of a tool for the designer to get clear about what they're designing, rather than as a tool for the learner. I agree with Clive that they're like the opening credits--something to fast forward through to get to the (hopefully) good stuff. Cammy, great post, sometimes I ask a series of questions related to the objectives instead of listing the objective...like, for a safety piece, Do you know the top 5 reasons for injury at ABC corporation? or What are the three things you can do to prevent serious injury at the lathe work station? Also, I sometimes like to start with a scenario that does not have a clear answer and then ask a question I know the learner will get wrong and then, throughout the course, explain to the learner why their initial answer was wrong. Take a bit more design but is more engaging to the learner and retention tends to be higher. Cammy, great post. It's presumptuous and confining for developers to foist objectives on learners, for it disregards the learner's needs, prior learning, and context. In their place, how about a list of useful potential outcomes with checkboxes? Objectives are important, and we can sometimes guide learners develop their own. Jay...I see where you're going with the checklist idea. But I still think that turns into a boring text page with bullets that the learner will probably skip right over in a Next Button clicking frenzy. Perhaps one could make this an interactive list. What are the outcomes you'd like to achieve for yourself from this course? Or back to the scenario idea, present some potential outcomes through a story. I think your point is really important -- that learners need to be able to develop their own objectives. Wouldn't it be revealing to quiz learners 15 minutes into a learning experience with one question: List 3 of the x learning objectives listed at the beginning of class. I gloss over during them and suspect my prisoners do, as well. I sat in on a couple of Michael Allen's sessions at ASTD 2007 and when he advised us to spare our learners from learning objectives, it really surprised me. To give learning objectives their proper light, he DID say they are extremely important to the developer (and the trainer, I suppose), so he did not advise us to throw them out; just to spare the learner. Michael showed us an example of the "drama" approach you cited, Cammy, and it was extremely effective. The basic idea: "Flight attendants, if you don't know where the emergency equipment is, here is a depiction of your plane going down over the ocean." VERY engaging and it certainly salted the oats for the learners to really WANT to know the information. I Picasso-ed (recently, a trainer told me that Picasso had said, “Good artists borrow; great artists steal.” Hence, “Picasso-ed”) this concept to hook managers on how things would go south if they screwed up the hiring process. Drama gets people at the emotional level, which has been shown to [research research blah blah blah]. In his research paper “The Learning Benefit of Questions,” Will Thalheimer argues that questions introduced prior to content has a notable impact on learning. So a reasonable alternative to the “At the end of this class you will be able to” list is a series of questions. A question will serve the dual role of (a) alerting the learner to what is important, and (2) set the learner’s subconscious discovery process (“2?”) in motion, getting his mind engaged to discover information, connect dots, and reach conclusions. Thanks for the post, Cammy. By the way, I started reading you because Clive Shepherd has you on his “Blogs I Like” list. Chirs...Thanks for stopping by and adding some great points to the discussion. I've heard people talk about the now famous Michael Allen plane-going-down-course-intro scenario. Very dramatic...and a great escape option for your prisoners. The Will Thalheimer approach to presenting questions that you mention circles back a bit to Jay Cross's suggestion of a checklist. I say we should make it interactive to take it to that next level. And Clive is definitely on the top of my Blogs I Like list! I stand by what I have published for the past 12 years on my website and what I have espoused for many more years than that. Job-task or performance related training should be based on the tasks that a person will be expected to perform on the job. Performance objectives, content, practice, and the testing included in the training event or events need to be congruent with job tasks. Whether or not the objectives should be disclosed to the learner is secondary to their existence and congruence. Personally, I don't like to hide things from learners and play guessing games, so I am an advocate of letting the learner know, up front, what they will be expected to do at the conclusion of the course, lesson, or whatever. If they choose to skip that part of the course, then that's OK by me, they must still meet the objective(s) before they complete the course. For more on this, see tips 2, 3, and 13 through 17 on my web site, peteblair.com. Pete....Thanks for chiming in. Your website looks like a great resource with many useful tips for Instructional Designers. I want to clarify that I'm not advocating that we "hide" objectives from the learner, but instead provide some alternatives to boring text bullets in the presentation of those objectives. Today's learners are expecting more streamlined and engaging eLearning experiences. Anything we can do to make that happen will make for better learning, don't you agree? 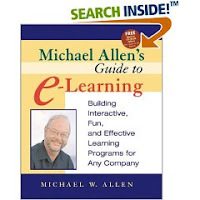 In my view Michael Allen has some excellent approaches to making e-learning "more interesting"; primarily by dissociating it from training and treating digitally-mediated learning as a range of learning channels in their own right. This approach is particularly useful if learners are undertaking occasional learning, and may be taking modules of a course over an extended period of time. The key phrases act as aides de memoirs if they haven't visited that course for a while. If done correctly, these phrases also provide excellent metadata to enable users to search for relevant materials if they're searching for learning content on an LMS/CMS. Well that's a bold statement, and I like it! When writing software courses (of which I have been writing many of late), I try to keep the lesson titles very task-based, so it's obvious to the learner what will be covered. In my mind, this gives it a job-aid feel as well -- quick access to the topics you need right now. I won't say I've delved into a Hardy-esque literary-style with this as you suggest...but I may now have to crack open Jude the Obscure for some inspiration! Just as a follow-up on this topic, Bersin & Associates have just released a case study called Qualcomm Implements an Informal, On-Demand Learning Environment through Storytelling, which descibes some of the ways Qualcomm uses narrative techniques as a strategy for organizational learning. 1. Does the story fits into one of the company’s cultural themes, such as execution or innovation? 2. Does the story meet some other organizational goal? 3. Does it share an organizational norm or information about the culture that would be of interest to people? 4. Is it a teachable moment with a lesson learned? 5. Is the story memorable? Click here to download (registration required). I love learning objectives. I want to see them before I register for any course: even a free course because my time is not free. But, if I've already started a course (both as a learner and as a learning designer), more than objectives, I prefer to have questions, scenarios etc. I still prefer to have the objectives displayed to learners so that they know exactly what they are going to learn and they can map it to both the questions/scenarios and their work (and often in many more different ways than we may have time to cover (or even in ways that we may be unaware of) in a course). Such an interesting discussion on learning objectives. I think the problem from the learner (and designer) perspective is that they are stated as if the learner will be or is a passive participant. What if they were presented as "challenges"--in the course, you will be challenged to learn or have the opportunity to solve these problems? This could an interactive approach where the learner defining outcomes for themselves. In general, I think the reason many people do not like e-learning or find it ineffective is because it marchs the learner through objectives--the learner is not involved in determining or influencing outcomes or learning--this is a fundamental form of engagement (not just entertainment). Until we address that, e-learning is always going to feel passive to the learner and we all know what "passive" does to learning. Hey, Anonymous: You're ideas are too good to stay anonymous! Why not sign in next time? You pose some good thoughts to mull over. Do you have an example of the "challenge" idea you could post? As a newbie to ISD much great food for thought here. I do wonder from the point of view of a portfolio piece, will not having formal objectives in the beginning be seen as a mark against me? Will I be judged as someone who doesn’t understand ISD principles? Or worse yet, as somebody “too creative” to be hirable by a company that does more routine training? What you'd be showing is that your focus is on the performance outcome -- who's not going to like that?! Of course, you may have to ask yourself the hard question -- do you really want to create that more traditional program? would you be happy? Amazing post Cammy... I'm just wondering how did i miss reading this post all these years. I think for entertainment you ought to post this somewhere like a LinkedIn discussion for trainers. As with the issue of whether a trainer should "allow" people to use phones or computers during a session, to say nothing of the even more controversial subject of whether you ought to have handouts, you'll get all kinds of reasons why no one should even think about the possibility of considering whether to leave the ritual incantation of objectives out of the start of training. Like the sane commenters here, I think Mager-style objectives are a very useful tool for the instructional designer, especially if he doesn't get lost at the nano level. If you can't explain in objective terms what someone can accomplish with the skills and knowledge in your course / lesson / experience / event -- when the person lacks that skill and knowledge beforehand -- then perhaps you've mistaken workplace learning for sales and marketing.